While at Convergence three weeks ago, I had the pleasure of attending the Government 2.0 session, put on by Amir Capriles from our US Dynamics Public Sector team and David Bankston, CTO of Neighborhood America. They ran a great session talking about the future direction of government and gave us a way-cool sneak preview of the Microsoft Public Sector Idea Bank, which has just gone live this Monday morning! The Microsoft Public Sector Idea Bank is a “Digg-style” Citizen Network designed for Public Sector Professionals and Dynamics CRM Partners to discover existing Dynamics solutions as well as collaborate on ideas for their solutions. Out of the gate we’ve announced the availability of six new government & education offerings, however, the Idea Bank will serve as a central collaboration vehicle for Microsoft, its partners and public sector customers to interact, discover new solutions and share ideas for new tool development. The Idea Bank is built on top of Neighborhood America’s Reveal Idea Elevator engine but what is most interesting to us on the CRM team is how they’ve integrated this with Microsoft Dynamics CRM to provide an even more compelling solution. On the front-end sits Reveal and on the back-end all of the site activity can be managed using the full power of Microsoft Dynamics CRM. 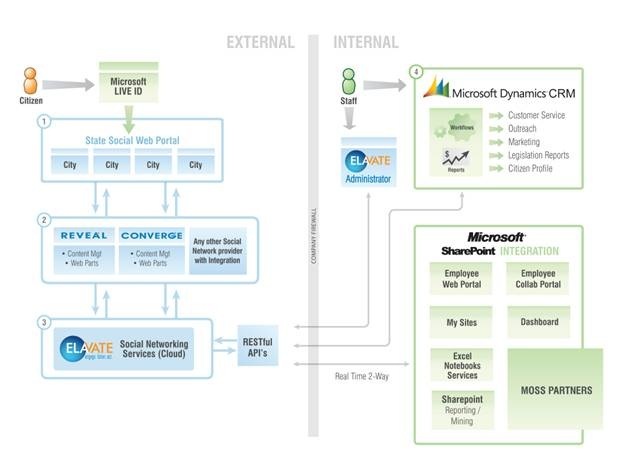 With the Dynamics CRM integration, our Public Sector team is able leverage CRM for things such as profile management, reporting and workflows; giving them a familiar & actionable toolkit for interacting with the Public Sector community. Wanna find out more? Check out the Public Sector Idea Bank today at http://www.publicsectorondemand.com/!